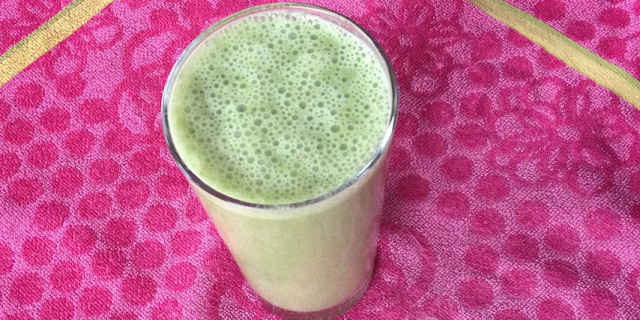 This Super Antioxidant Smoothie with swiss chard and pear is the best way to start your day. Swiss Chard is rich in nutrients and is one of the most nutritious vegetables around, a great source of vitamin K, manganese, magnesium and calcium for bone health, antioxidant vitamin A, vitamin C and E; heart-healthy potassium; and energy-producing iron. Swiss Chard has many health benefits, including regulating blood sugar, reducing inflammation and fighting free radical damage. Swiss Chard is perhaps most celebrated for its high variety of antioxidants. Researchers have found at least three dozen of antioxidants in Swiss Chard, much higher than most vegetables, that help combat oxidative stress. Antioxidants are your best defence against fighting the stresses of our daily living environment and therefore crucial for your health. External toxins, especially cigarette smoke and air pollution but also alcohol, trigger substantial free radical production. Antioxidants work to stop the damaging, disease-causing chain reaction that free radicals have started. For more info on the health benefits of Swiss Chard read here. Add all ingredients to a high-speed blender, pulse until smooth and enjoy the benefits of this Super Antioxidant Smoothie right away!